The small and very homely estate is located near Siena (12 km) to the edge of the Chianti and Siena in the hills, a peaceful landscape. Arezzo, Colle Val d 'Elsa, Volterra, San Gimignano, Assisi, Florence and the Mediterranean Sea are about an hour away from home. 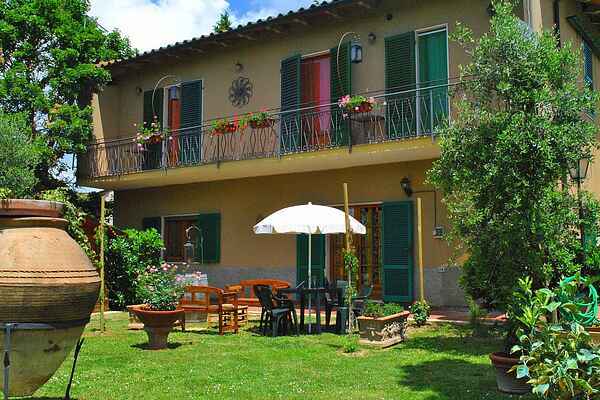 It's a small private estate with three houses, which is managed by Grazia and Simone. They are both very experienced in hosting and have been organizing for years wine and oiltastings, and they also sell the vegetables from their garden! The fine apartments and the swimming poolavailable to all make it a holiday paradise for everyone. Near the apartment there is a fountain that prevents the reproduction of mosquitoes. The little fish in the fountain eat the eggs and larvae that the mosquitoes lay on the water and prevent more mosquitoes! Our herous! TIPS - Tourist Information IN CASTELNUOVO-BERARDENGA 5KM SIENA 12KM ONLY, THE BEST WITH BUS DEPARTURE IN FRONT OF THE HOUSE The crests OF SIENA, WORLD HERITAGE 5KM MONTALCINO THE FAMOUS WINE "Brunello di Montalcino" PIENZA TODAY THE CHEESE CITY, in the 14th century it was the POPE's SUMMER RESIDENCE THE RESORT IS VERY SUITABLE FOR CYCLING TV on request, one week before stay.